Running uTorrent under wine works pretty well in Linux. One problem with installing under wine is that file associations are not set correctly. This means that double-clicking a .torrent file or opening a .torrent link in your browser won’t automatically start uTorrent. Here’s how to solve that. torrent_file="Z:`echo $1 | sed 's/\//\\\/g'`"
This is the main script that we’ll start uTorrent with. Basically, if given a file path on the command line, it will transform it from a linux path to a wine path. /tmp/sample.torrent will become Z:\tmp\sample.torrent. The sed bit comes from an Ubuntu forums thread. 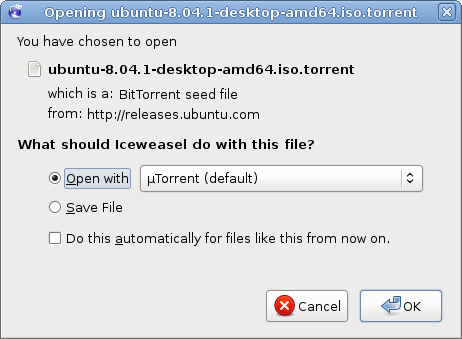 Iceweasel offers to open a torrent with uTorrent running under wine. Thank’s, awesome guide. This had been the only thing stopping me from using uTorrent. Thanks so much! This works perfectly – and explained extremely well to make it very easy. Sorry, I just got it to work :( The problem was that Open With: had ubuntu.exe instead of ubuntu(default). Thanks for the help, all the other places I found just wanted me to use a native linux app, NONE OF WHICH worked as well, I never even tried Azaureus since it’s a resource hog. Did you have #!/bin/sh at the top? That’s what should make it run with sh. I just noticed that in the code boxes, in some places you actually have the greek “micro” symbol and not just a “u”. I checked with a hex editor and this is apparently a two-byte code: C2 B5 (hex). I did the whole thing cut & paste with no problem. And now notice that gnome file browser and gedit both have no problem displaying the greek letter. The linux filesystem obviously has no problem with it in filenames. But I am curious: how do you enter these manually in the first place? I followed these instructions successfully several months ago — main reason was to make uTorrent the default torrent app in firefox. It worked great (although I may have had to do some other steps that I now do not recall — I really should write these things down!). That was with FireFox 3.0.13. Unfortunately it is now broken with the new FireFox 3.5. Either FireFox 3.5 has failed to import something from 3.0.13, or it is failing to read the Gnome mimetypes in the same way. I cannot remember if I had to do anything extra to make Firefox find the app or recognize it as a default. One small thing I did have to do differently from btmorex’ instructions was to edit (or create?) the file: ~/.local/share/applications/mimeapps.list instead of ~/.local/share/applications/defaults.list. (maybe this has something to do with the version of ubuntu — I’m currently using 9.04 and I believe I was running 8.1 when I first did this — in both cases it was “mimeapps.list” not “defaults.list”, and it worked). Anyone have any thoughts about what I need to do to make FireFox 3.5 see uTorrent as an app for bittorrent, other than the above excellen instructions? Yet another grateful Linux user, even years later. Yes, I know about the new Linux version, just waiting for it to go GUI, webUI doesn’t do it for me. This worked perfectly as described. Firefox 3.6. Well, the very last step, association, tried both default.list (created) and mimeapps.list (existing) (thanks for that s.k. graham), got this: “No directories in update-desktop-database search path could be processed and updated.” But we’ll deal with that soon enough. Thanks, just great!